It can be funny, the things you notice. If there is a theme to this season’s cruise, it would be islands. The goal is to sail Windleblo to as many quirky, remote islands along the New England coast as sensible. Cuttyhunk certainly fits the bill. 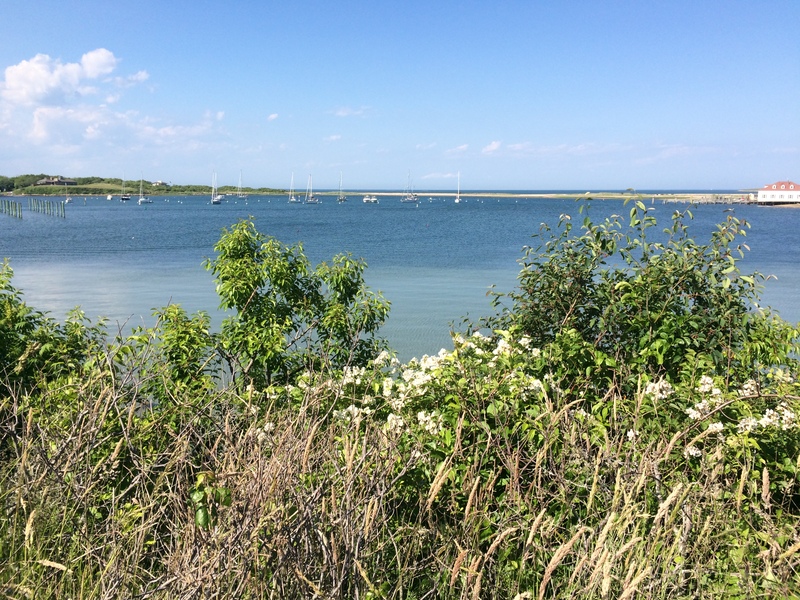 The outermost of the Elizabeth Islands, Cuttyhunk was initially occupied temporarily in 1602 for the harvesting of sassafras, arguably making it the first English settlement in New England. The island changed ownership a few times in the 17th century, eventually landing in the hands of the Slocum family who lived here for 200 years. In 1858, three men bought the island from Otis Slocum for $50. For years thereafter, it served as a private fishing club, then as a summer getaway for well-heeled families, a purpose it still fulfills to this day, though rustic cottages are the rule, not opulent Newportesque mansions. As soon as we dinghied to shore, we noticed the vibe. The island vibe. Things are slower here. For one thing, there are very few people around. And that’s understandable. Wikipedia lists Cuttyhunk’s permanent population at 52 souls, though that number swells considerably on a warm summer day when hordes of day trippers ferry in from the mainland. But few of the day trippers are here this early in the season. And there aren’t many cruisers either. 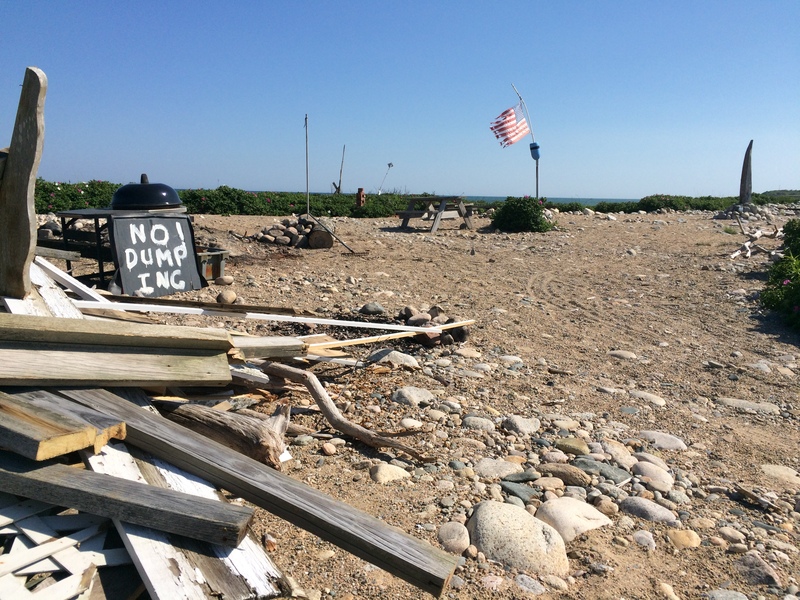 We took one of the 80 mooring balls in Cuttyhunk Pond maintained by the island’s town government. Almost all the others are vacant. Most of the few people we see are sitting quietly on decks or patios under the warm afternoon sun. It seems that watching the world go by, or at least the rotation of the sun, is the main pastime here. 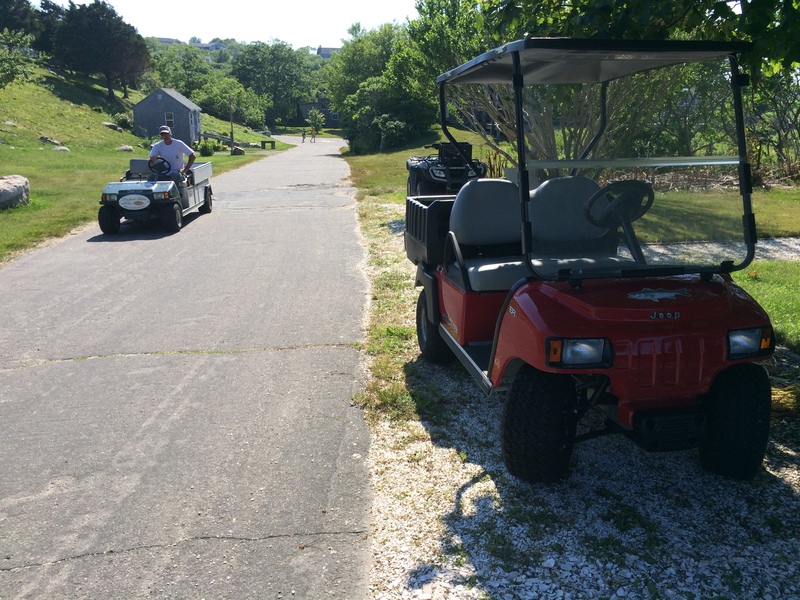 The few folks in motion amble by in golf carts, full size vehicles being rare. Jocelyn wants to investigate a lead she saw on a community board at the docks for the season’s inaugural breakfast to be offered tomorrow morning by the island’s fishing club. Turns out the fishing club looms large in island history, having been established in 1865 by some prominent New Yorkers disenfranchised by the fishing rules at home. Rather than review the breakfast menu, I prefer beach combing. We split up. On the way to beach, I pass the ferry landing. On the dock, I notice a local man about my age with a big ZZ Top beard hollering at a kid about something. Nothing disciplinary, mind you, just some sort of comment about fishing. The comment is liberally sprinkled with the f-word. I recall that in crossing to Cuttyhunk, we entered Massachusetts, where such vocabulary is the norm, even with children. I chuckle as I realize I have returned to the land of Massholes. The beach offers a display of nature in raw form. 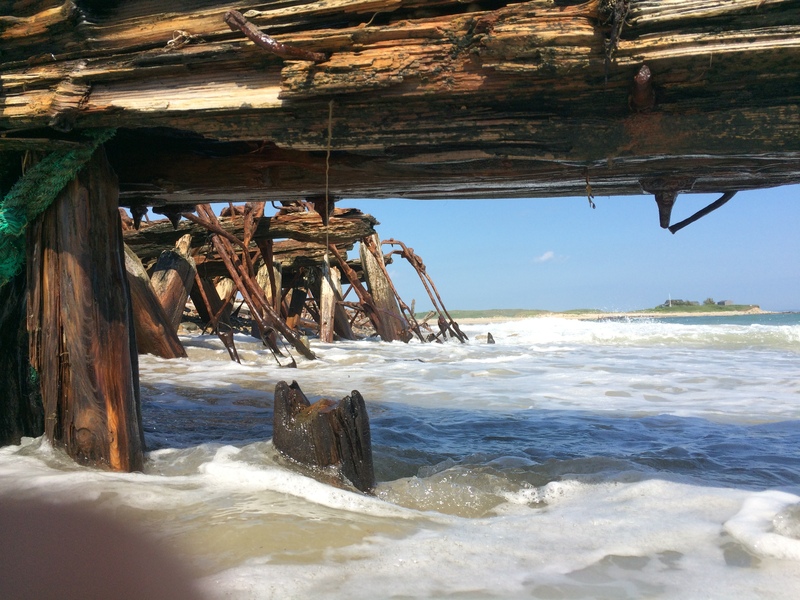 Abandoned piers disintegrate in the surf, a reminder of the power of the ocean. I climb to the high point on the island. En route, I encounter a Flying Scot sitting on its trailer on the side of the road. Here is a sister ship of the very boat in which I learned how to sail, abandoned to the wind and rain. 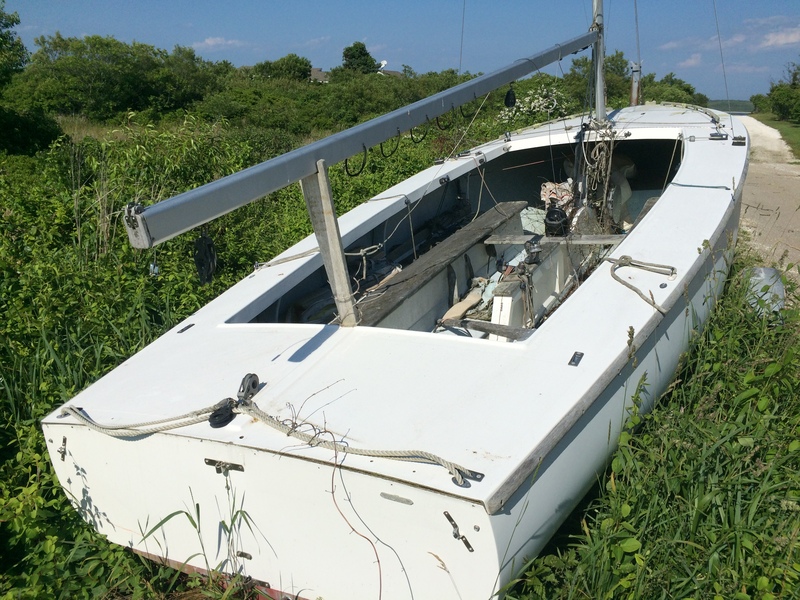 Despite its decrepit state, it brings back memories of racing in my boyhood town of Cohasset and trailer sailing on Lake Winnipesaukee years ago. I’ll return to both by the end of the month. Reaching the top of the island, I see more abandoned man-made creations, this time some structures built as U-boat lookouts in World War II. 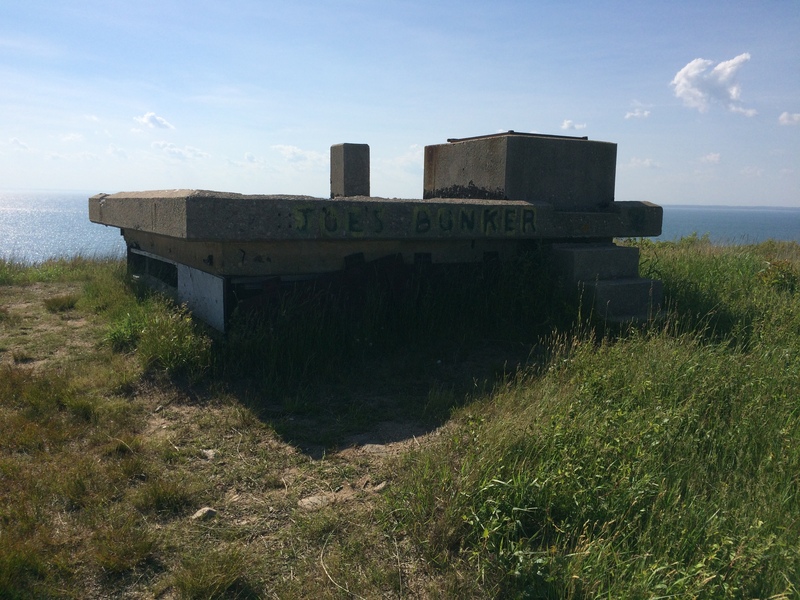 One is labeled “Joe’s Bunker,” presumably after an itinerant local who had squatted within. Nearby is a viewing platform built by the federal government as a gift to island inhabitants. 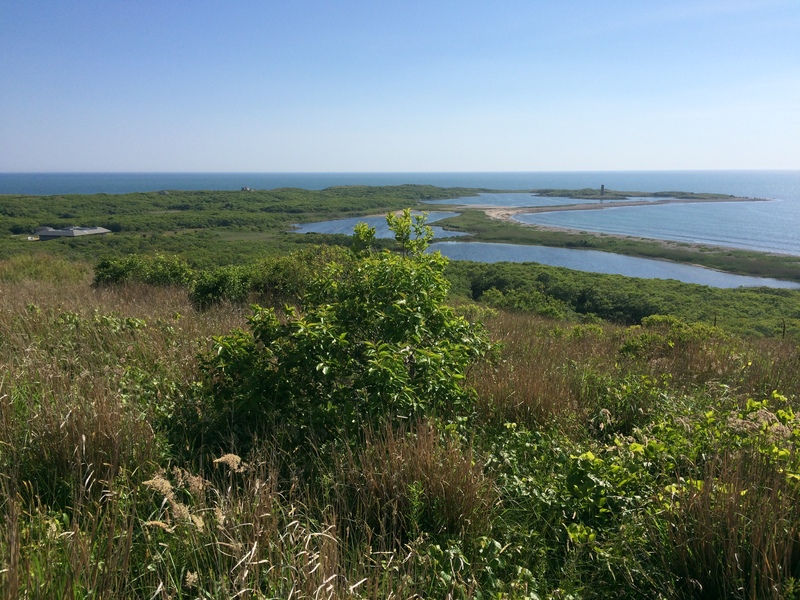 From here, the island spreads out below, with Gay Head on Martha’s Vineyard’s southwest corner prominent across the water. Descending to the mooring field, I find Jocelyn. She reports that an islander has advised her that the fishing club breakfast is overrated. Oh well. Granola for breakfast tomorrow, I guess.